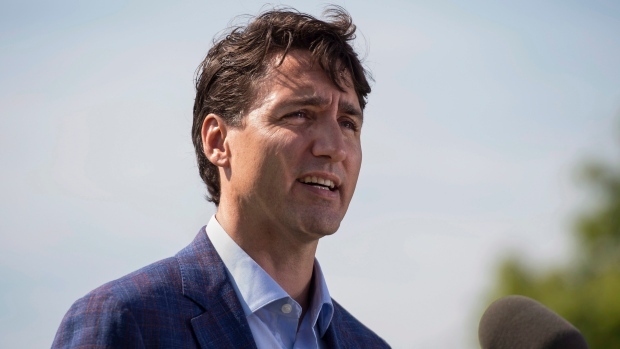 OTTAWA -- Prime Minister Justin Trudeau says his government wants to improve its relationship with Saudi Arabia, but will not sacrifice Canada's position on human rights. Trudeau made the comments a little over a week after the Kingdom of Saudi Arabia suspended diplomatic relations with Canada and expelled the Canadian ambassador after a series of tweets from the Canadian government criticizing the arrest of some social activists there. "We continue to engage diplomatically, but as I've said, Canada will always be very clear on standing up for human rights," Trudeau said Monday when asked about the diplomatic dispute. "We will make sure that message is clear in public and private. But of course we look to improve relations while remaining firm in our values." The tweets that triggered the feud were posted 10 days ago by Foreign Affairs Minister Chrystia Freeland and her department, and urged the Saudi Arabian government to immediately release several social activists arrested in the kingdom. Saudi Arabia has since taken steps to cancel the scholarships of nearly 15,000 Saudi students studying at Canadian colleges and universities, stop the Saudi state airline's direct flights to and from Canada, block new trade deals with Canadian businesses and ban the import of Canadian wheat. A spokesman for Freeland said the minister is still trying to get more clarity from the Saudi government about the measures it is taking -- clarity that remains elusive nearly a week after the dispute began. Freeland had a phone call Tuesday with Saudi Arabian Foreign Minister Adel al-Jubeir, and officials have been in touch since, said Freeland's spokesman. Another call from Freeland herself is not scheduled but is not out of the question, said the spokesman. The government has, however, remained tight-lipped about former Conservative foreign minister John Baird's suggestion that Canada was wrong to issue the "hectoring tweets" and that Trudeau should fly to Riyadh to apologize in person. "For Canada to treat a friend and ally this way has been tremendously unhelpful and disappointing," Baird said in an interview on Saudi's state-owned broadcaster Al Arabiya. "We had respectful discussions face to face, not hectoring tweets," Baird said of his direct relationship with the government during his tenure at Foreign Affairs. Baird himself was publicly critical of the Saudi Arabian government's treatment of activist blogger Raif Badawi in 2012, after Badawi was sentenced to 1,000 lashes and 10 years in prison for promoting secularism and freedom of religion. "This punishment is a violation of human dignity and freedom of expression, and we call for clemency in this case," Baird said in a statement issued by the government. Raif Badawi's sister, Samara Badawi, was one of the activists whose recent arrest prompted Freeland to tweet on her behalf. Critics of Baird took to social media Monday to point out the former minister's financial ties to Saudi Arabia, including his role as an international adviser to Barrick Gold Corp., which owns a copper mine in the country. 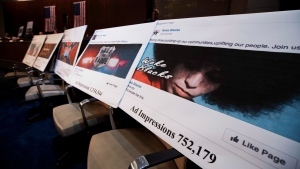 Elections Canada has sent a new edict to online platforms like Facebook and Google to inform them of the need to abide by new political advertising rules, and is warning that not complying could result in thousands of dollars in fines or charges.